FlightFox and I joined forces to launch their biggest contest to date, “Startups Around the World.” I challenged FlightFox Experts with the task of building an itinerary that would take me to 36 cities in 29 countries around the world. This is a guest post by Bowei Gai, founder of the World Startup Report, former CEO of Cardmunch, and a first-time Flightfox user. I was astonished by the results – astonished not just by the cost savings presented (which were substantial) but also by the genuine interest and personalized care that FlightFox Experts demonstrated while organizing my trip. It warmed my heart to have so many Experts dive right in, discerning my needs by asking thoughtful questions, and helping me refine my World Startup Report journey. Thank you, Experts, for extending your helping hands to me! Trust me, I needed them! With your help, not only do I have a spectacular itinerary at a price I didn’t even imagine possible, I also learned a ton about world traveling. As my way to give back to the Flightfox community, I thought it would be fun to discuss the whole experience from the Flight Requester perspective and give the Experts some insight into the thought processes of a trip planning neophyte. I want to talk about my experience behind the curtain running this contest and shed some light on the inner workings of an untrained mind. I hope to help you win not only more contests, but also the hearts of the people you’re helping out in this amazing community. As I am sure is painfully clear, I am new to the process of world traveling. Naturally, I struggled while trying to come up with a sensible and cost effective itinerary on my own. Thank goodness a friend finally turned me onto Flightfox. The process was so simple! Just tell a bevy of travel experts where I need to go, give them any restrictions or considerations to be factored in, and then leave all the planning in the capable hands of someone who wasn’t me. It seemed too good to be true but I decided there was nothing to lose and I took a leap of faith. I did my best to explain my requirements in a post, took a deep breath and hit submit. The response from FlightFox Experts was immediate, with questions and advice pouring in. After a few days of fielding comments asking me for various clarifications and if I had any schedule flexibilities, my first proposal came in! 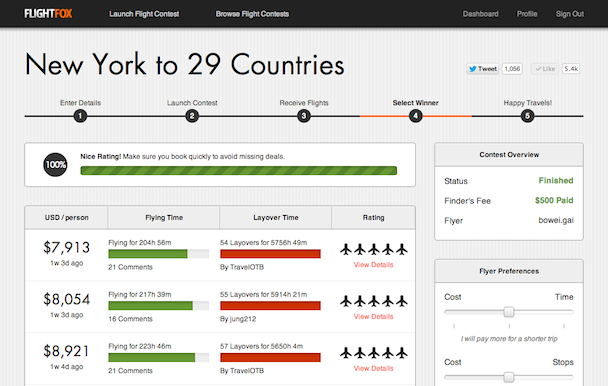 hans.steffen submitted an itinerary that came to an impressive $11,000 grand total. My jaw dropped when I saw this price. Based on my own clumsy attempts prior to FlightFox, I was expecting to have to spend twice that amount! I started getting very excited. 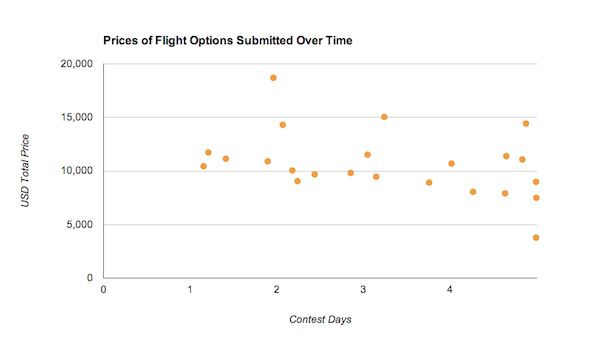 Over the next few days, more and more submissions kept coming in (see graph). Experts were now routinely sending me itineraries that hovered at the $10,000 mark and just when I thought things couldn’t get any cheaper, jung212 surprised everyone by posting a Guinness World Record worthy $8,000 submission. I was beyond shocked by the capabilities of FlightFox Experts at this point. Many Experts were chiming in during this whole process with recommendations and advice along with proposals. After seeing how inexpensive this trip could truly be, I realized that I could afford to be less price sensitive and started focusing more on the quality of flights that could be booked. I learned to pay attention to important factors such as: flight time, comfort level and weather conditions. I also started exploring the possibility of business class flights after DennisSFO proposed an affordable itinerary containing a number of them. I believed that I had decided upon a winner but then, on the last day of the contest, I received a proposal from xro that was a game changer. His itinerary contained virtually all business class flights and came in at a whopping $16,000. At first, I was taken aback by the cost but after reading the detailed explanation sent along with his submission, I was sold. First and foremost, he is a fellow startup enthusiast. His expertise comes from planning a trip almost exactly like mine for himself a few years ago so he has firsthand knowledge of the experience. He impressed upon me how tough this trip is going to be, if for no other reason than the sheer scope of it. He advised that I should seriously consider booking all if not the majority of my flights in business class rather than economy. The logistic, productivity and health advantages of taking business class flights far outweigh any cost savings that I could glean from economy. Business class would allow me to arrive at my destinations more rested and ready to jump right into work. In addition, I would also have access to the business lounges while waiting to board where I could choose to work or rest and again, ultimately improve my productivity. Lastly, in the event my schedule needs to be changed or flights cancelled, it’s going to be much easier amending and rebooking with business flights. Having said all that and giving me his strong and very convincing recommendations for business class travel, xro still provided me with a list of economy flights that could be swapped into the current itinerary and potentially save me $5000. This was wonderful; I really appreciated how he tried to balance my needs in a way that was still cost effective to me. xro went one step further and arranged my schedule to limit my exposure to weather delays (such as snowstorms in Europe). xro made sure that I made it back to San Fransisco in June for my girlfriend’s graduation and even helped plan a bonus trip to Hawaii afterwards as a gift. And to top everything off, he suggested local events worth checking out while in certain cities, and even offered to introduce me to his friends in these places. What a guy! From our exchanges online, I felt an immediate kinship with xro, even though we have never met in person. That was an incredible experience and one I was not expecting. In the end, it was xro’s proposal with its attention to detail that won out, even though a proposal by XtremeTravel came a very, very close second. Congratulations xro! The Contest Winner! When a flight requester is unsure of his/her needs, trust becomes as important, if not more important than the end price. Have patience and be understanding towards your flight requester. Listen to what they say they want, but also educate them whenever possible. E.g. In my case, I thought price would be my most important consideration but I didn’t realize how beneficial comfortable travel would be to my productivity. Listen and ask for feedback. At the end of the day, the flight requesters want to feel like they have control. Attention to detail matters! tojennabelle included a special flight in her proposal that would allow me to fly back to San Francisco for Valentine’s Day! That melted my insides and got the biggest AWWWWW from me as I was reading it. Speaking of reading, this was a long post and I thank you for sticking with me. 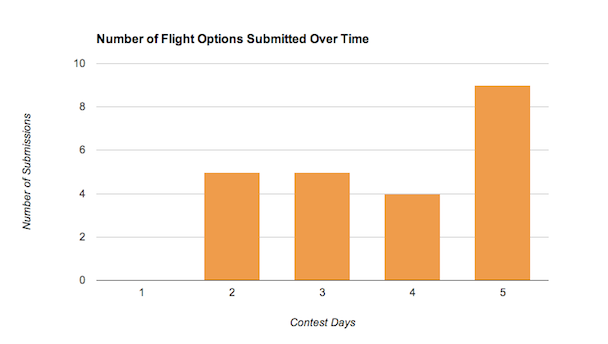 I hope hearing about my experience with this FlightFox contest provided you with some insight and helps you win more contests in future! It’s been a memorable week, Experts. From the bottom of my heart, I want to say THANK YOU! I could not be more grateful. Please follow me on Twitter to get my latest updates and location. If you find that I am in your city, I’d LOVE to treat you to a coffee/drink/meal so that I can thank you in person and hear your stories.